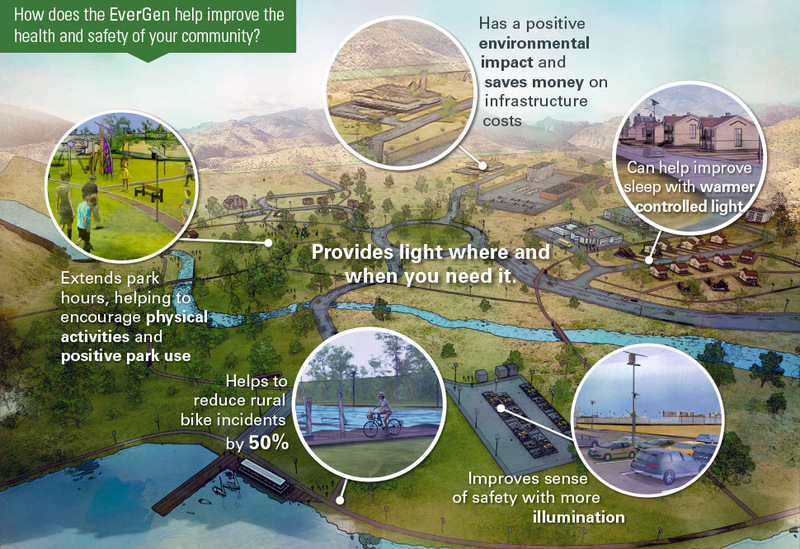 Solar outdoor lighting can play a critical role in building sustainable communities. Sustainability isn’t just about being “green”—it involves economic, social, and environmental consideration. The advantages of solar street lights are that they improve community sustainability because they can create social change, they’re financially smart, and they’re good for people and the planet. The National Recreation and Park Association recommends finding ways to “encourage greater use and ultimately create a safer park environment,” and it lists lighting as a factor to “enhance perceptions of safety.” Some city parks departments are seeking ways to use park and pathway lights to help improve walkability and increase attendance of positive activities after dark. An early-morning jog, after-dinner visit to the dog park, or late-night bike ride home is possible when a space is lit. San Jose was the first city to install Sol’s EverGen lights, helping increase access in Chris Hotts Park while also aligning with their renewable energy goals. Summer Night Lights, a program started in Los Angeles, extended nighttime hours in parks by keeping lights on until midnight. Read about how the Summer Night Lights program became a national model for violence reduction. Social change can also occur on the streets. With nearly 870,000 bicycle commuters on the road in 2016, there is also an increase in traffic incidents. Studies have revealed that adding illumination to rural roads can help reduce accidents by more than 50%. >> See how the Lummi Nation Indian Reservation used our solar lighting systems to help reduce traffic fatalities while maintaining community values. In many cities, 1 in 3 residents does not have access to a park. Access to parks can increase physical activity levels: in 2014, more than 70% of the US adult population was overweight. Even if park use was enhanced just enough for a 5% reduction in diabetes, hypertension, and related conditions, health care costs could be reduced by $24.7 billion annually. Sources: The Trust for Public Land; Centers for Disease Control and Prevention. As the cost of electricity continues to climb, companies and municipalities seek new ways to keep energy bills low. Using solar commercial lighting not only removes the monthly utility fees, but also avoids compounding future expenses for aging infrastructure repairs. And with an installation cost that’s comparable to on-grid AC lighting, solar lighting improves community infrastructure while also offering long-term economic savings. The City of Los Angeles began to use solar lighting after spending almost $1 million repairing more than 700 street lights due to copper theft. Sol’s EverGen solar lighting system is designed with the components at the top of the pole, making theft extremely difficult. 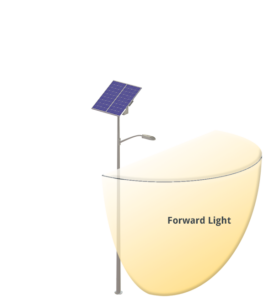 Solar lighting uses renewable energy instead of fossil fuels, which can be appealing to communities with a desire or initiative to be more sustainable. Since trenching for wiring isn’t required, solar outdoor lighting also avoids environmental disruption during installation and maintenance—also making lighting possible in environmentally sensitive areas. But not all solar light is created equal. Warmer LED Light: The EverGen can be paired with warmer-white LED lights of 3,000K that meet required light levels. Bright, blue-white LEDs create unnecessary glare and impact safety on roadways. These color wavelengths also disrupt our sleep and have other lasting effects on humans and animals. Dark Sky Friendly: Our LED fixtures keep light where it’s needed to protect the environment, prevent glare from street lights into residences, and save your city money. Today, 80% of people can’t see the Milky Way, mostly due to increasing light pollution as our cities grow. Don’t let prohibitively expensive grid-powered installations or sensitive landscapes prevent you from adding light where you need it. Learn how we’ve made lighting the impossible, possible. 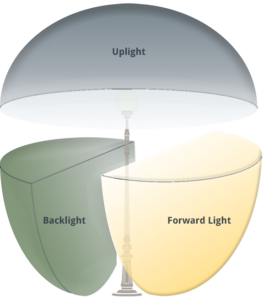 Looking to find more solar lighting advantages?